Skipper Jerome Vinith was the leading scorer for Calicut with 17 points (14 spikes, 1 block and a super serve). Calicut Heroes maintained their unbeaten run in the league stage of the Pro Volleyball League with a 4-1 (15-14,11-15,15-11,15-9, 15-8) defeat of Ahmedabad Defenders on Wednesday. 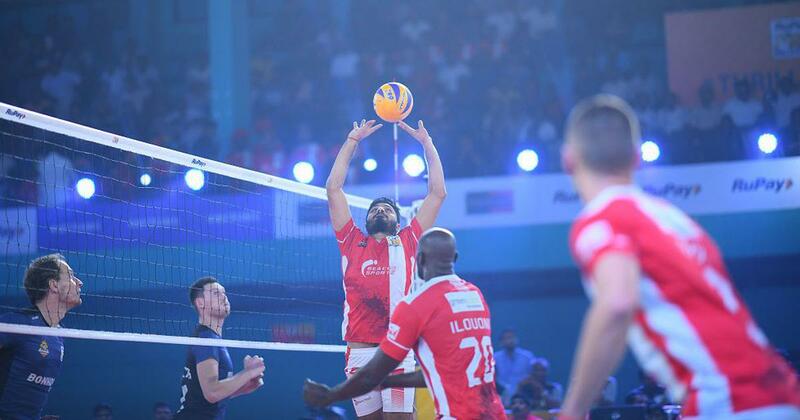 Skipper Jerome Vinith was the leading scorer for Calicut with 17 points (14 spikes, 1 block and a super serve). Novica Bjelica (8 points) was Ahmedabad’s highest scorer. Ahmedabad surged to a 5-3 lead, aided by two errors from Calicut. But the latter came back to lead 8-6 at the first Technical Time Out. The last few points were hard fought and it looked like anyone’s set till 14-14. A spike by Paul Lotman won the set for Calicut 15-14. In the second set, Ahmedabad took an early lead but, like the previous set, Calicut came back to level it 5-5. Ahmedabad was determined not to fall behind and went into the TTO with an 8-6 lead. Calicut called for a Super Point at 6-9 and converted to close the gap to 8-9. Ahmedabad extended the lead even further as they went to 13-10. At 14-10, Ahmedabad had their first set point but could only seal the deal at 15-11 when Vipul Kumar’s spike went out. The match was now level at 1-1. Ahmedabad, in the third set, led 5-2 displaying good attack and defence. But Calicut won the set as Ajith Lal closed it 15-11 with an inch-perfect spike. As the fan support increased, Calicut raised their game, taking an 8-1 lead with Lotman acing a Super Serve at 6-1. Ahmedabad seemed to have lost their way. The conversion of a Super Point by GR Vaishnav also seemed futile as the gap of points was too wide. 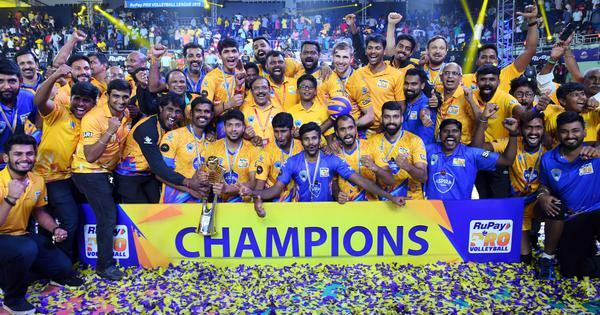 Calicut won the set 15-9 that ensured an unbeaten end to the league stage for Calicut. The last set Calicut won 15-8, acing a Super Serve both converted by skipper Jerome Vinith. Though Ahmedabad won their Super Point at 6-10, they never looked like being in the game. Calicut won the match 4-1.